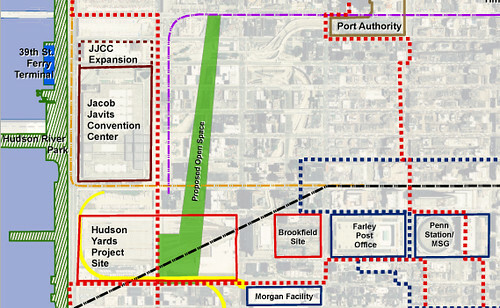 Know what is happening with the development of Moynihan Station. Submitted by mas_admin on Wed, 2008-09-17 12:34. Streetsblog provides a great wrap up of Monday's first hearing of the Ravitch Commission , a 13-member body, headed by former MTA Chair Richard Ravitch, that is charged with recommending strategies to fund MTA capital projects and operating needs over the next ten years, a period when the Authority will be under unprecedented financial pressure as it expands its system and rebuilds its infrastructure. Responsibility for adequately funding the MTA should fall on those who benefit from its services. The MTA needs more consistent and reliable revenue streams. The city and state have been derelict in their contributions to the MTA, and debt financing has gone too far. It is reasonable, even desirable, to institute regular and predictable fare increases, but straphangers are currently shouldering too much of the burden. The MTA must become more efficient and financially transparent. Read Ravitch Commission Faces Difficult Task of Shoring Up MTA’s Future by Ben Fried on Streetsblog. Submitted by mas_admin on Wed, 2008-09-17 11:37. 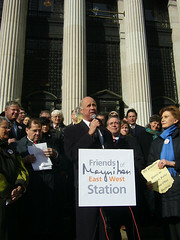 Eliot Brown writes about Paterson's new direction for Moynihan Station in today'sNew York Observer. Consistent with the project’s history, the pledge represents another turn in the project’s direction under new leadership. In prior permutations, the focus has been on revenue for the Post Office; an expansion of the train hall; a medium-size real estate transaction; and a mega-land-swap and an economic development project of gigantic proportions. 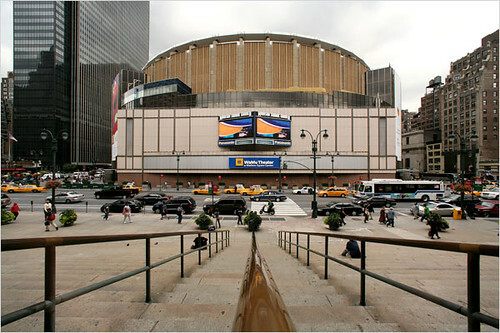 The most recent plan, which was pushed by the Spitzer administration and which unraveled in March, involved moving Madison Square Garden to the Farley building and thereby unleashing $14 billion in public and private development. Now, the Paterson administration seems to be focusing on rail capacity; the platforms and tracks under Penn Station have room for no more trains at peak hours, given the way they are currently used, and the prior plans involved a much-needed expansion of pedestrian and waiting space, but did not address this issue. Read Paterson Takes His Turn on Moynihan by Eliot Brown of the New York Observer. Read David Paterson: Port Authority should get ticket for new Penn Station by Douglas Feiden of the Daily News. Read Paterson Wants Port Authority to Pick Up Moynihan Project by William Neuman of the New York Times. Submitted by mas_admin on Fri, 2008-09-12 18:13. 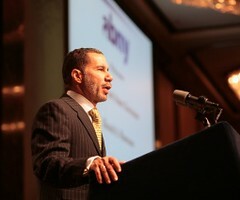 Today Governor David Paterson made a bold statement in support of the construction of Moynihan Station when he announced conditions related to the future of Moynihan Station at New York Building Congress forum. He emphasized the critical importance for the project to emphasize infrastructure improvements and to that end announced that the Port Authority of New York would be taking over the project. The Governor said that while New York City and State are in a difficult economic climate, fiscal responsibility is not just about reducing spending; it’s about making wise investments. Throughout New York State’s history, the government has moved ahead with infrastructure projects during times of financial insolvency. For example, the state was facing a deficit for seven of the ten years it took to construct the Erie Canal and the Lincoln Tunnel, George Washington Bridge and the Independent Subway System (IND) were all constructed during the Depression. Paterson said the Federal government must put together a plan for the nation’s infrastructure so we may reduce our dependency on fossil fuels and avoid catastrophic disasters like last year’s bridge collapse in Minneapolis. He also decried the Federal government's “starving” of Amtrak and reduction of slots at the city’s airports. The Governor said that we must bolster the rail options between Washington DC, Boston and other cities within 300 miles of New York City. Rail is the most fuel-efficient way to move people,, and it is critical that we lighten the loads of our airlines and on our highways. In the absence of a Federal transportation plan, Paterson said the State must develop its own plan. 1. Ensuring that the Moynihan Station project increases transportation capacity by physically expanding the number of tracks and platforms and instituting operational changes by Long Island Railroad, New Jersey Transit and Amtrak. Paterson announced that he was asking the leadership of the three railroads to report to himself and Governor Corzine on how they planned to work together. The Governor made it clear that it would be a formidable challenge to ensure that the project will be coordinated with major infrastructure projects like ARC and unifying the three transit systems of Amtrak, Long Island Railroad and New Jersey Transit. “This is why we want the Port Authority to take over the leadership in terms of constructing Moynihan Station, and what we are really saying is that with such major development occurring, there has to be coordination,” the governor said. 3. Taking necessary steps to ensure that the project also helps to revitalize the surrounding community. While the Governor acknowledged the importance of making Moynihan Station a Gateway to New York city and catalyst for development on the Far West Side, he said first and foremost this is a transportation project. “Increasing our transportation capacity is an important step, but it is only a one step. We must ensure that we carefully coordinate the improved capacity with other major development and infrastructure projects, which is why today, I called on my Deputy Secretary for Economic Development, and Infrastructure to convene all of the project’s partners from both the public and private sectors to discuss the challenges they face,” Governor Paterson continued. “Deputy Secretary Gilchrist will report back to me with an assessment of these challenges and potential solutions.” “By any measure the 20th century was the New York Century. We entered it as a burgeoning metropolis and we left it as the greatest and most powerful city in the world. We can make the 21st century the New York Century as well, but only if we invest wisely in our infrastructure,” added Governor Paterson. Read Governor Paterson's press release. Read Paterson Invokes New Deal in Calling for Fresh Moynihan Plan by Eliot Brown in The New York Observer. Read Paterson Gives Moynihan Another Shot by Matthew Schuerman of WNYC. Read Paterson appoints aide to look into Moynihan by Theresa Agovino of Crain's New York. Submitted by mas_admin on Fri, 2008-09-12 16:23. “The original Penn Station, while architecturally spectacular, was primarily a visual symbol of a great transportation system. The tunnels that lead into that station, which connected New York City to the mainland for the first time, were engineering marvels of the time. The Penn Station architecture was important and beloved, but the infrastructure it housed was a critical element of New York City’s rise to its position as the nation’s greatest city. “Paterson reminds us that, at this time in our history, it’s time to revive the railroad, and we couldn’t agree more with his priorities. Our friends agree as well. We must put transportation first. Penn Station was built in the beginning of 20th century, and we are confident that it is possible now, at the beginning of the 21st century, to accomplish the Governor’s transportation priorities while also creating the great entryway into New York City that Senator Moynihan envisioned. “Paterson’s plan of investment in the economy and our rail system shows a comprehensive grasp of all of the issues that the station embodies, from infrastructure to architecture. When MAS conducted a poll last year, we learned that people were dismayed with the inefficient and sloppy management of Penn Station. We know it will be difficult to eliminate problems with the three railroads, but we are confident it is possible. Submitted by mas_admin on Tue, 2008-09-09 23:45. This morning Governor Patterson addressed the future of Moynihan Station, among other issues, at the Crain’s New York Business breakfast forum. Below is his response to the question "Will Major Infrastructure Projects – Like Moynihan Station - Be Completed In Your First Term"? We are still trying to get Amtrak and our local transit systems to agree on how we could reroute transit and turn this into what would really be, in a sense, a favorable investment of our resources. I believe shortly Governor Corzine and I will probably go and meet with AMTRAK, because one of their plans, coincides with ours -- the ARC plan and we’d like to try to that get done. Everyone understands that the economy is a problem but my project must go forward. I don’t see how they can all go forward. The resources aren’t there. The capital isn’t there. And everybody wants to come to the government to be part of the solution. And right now the government is floundering because we have these huge deficits that we have to ameliorate. It sounds positive that Governors Paterson and Corzine are talking to Amtrak. Perhaps this means there's potential for the ARC/Penn Station connection. Let's hope they announce a plan to move forward soon. Read "Paterson Argues for Spending Cuts" on Crain's site. Read "Paterson Won’t Rule Out Tax Increases" by Nicholas Confessore in The New York Times. Submitted by mas_admin on Mon, 2008-09-08 14:09. Newpennstation was catching up with our reading this weekend, and came across the article "Winged Victories, The soaring ambition of Santiago Calatrava" from last week's New Yorker. The profile of Calatrava, written by Rebecca Mead, included this passage about what role train stations play in cities. 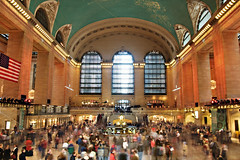 We couldn't agree more about that a train station should serve as a "grand gateway" to a city, and that Grand Central is a "gift to everyone." Has anyone been to the train station in Zurich? What do people think about the "shopping mall" impact he describes? "Winged Victories, The soaring ambition of Santiago Calatrava" in the The New Yorker by Rebecca Mead. Photo via flickr from Robbanz. Submitted by mas_admin on Wed, 2008-08-27 14:10. August has been a pretty slow news month in terms of our primary issue, the construction of a new Penn Station. 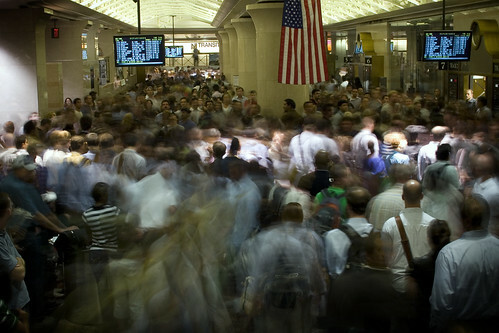 No news on who will be taking over the construction of a New Penn Station. No news on the scope of the new plan. But there’s been other, related news that’s important. The economic development corporation has been beset with geographic rivalries as downstate and upstate interests within the agency fought. Mr. Paterson said Friday that he hoped his nominees would bridge the longstanding divide between upstate and downstate interests. Maybe all the attention Biden is getting for commuting on AMTRAK every day will help increase the funding. Yesterday, Eliot Brown, in the New York Observer, questioned whether the nation’s crumbling infrastructure will be a factor in the national presidential campaigns. There's forces adding urgency to the infrastructure push: passenger rail is at or near capacity in much of the entire Northeast corridor, a condition exacerbated as high fuel prices push more people onto trains. And the gas tax (a flat-rate 18.4 cents per gallon) that funds highways and transit projects is taking in substantially less revenue as Americans cut back on their driving. Mr. Obama supports a national federal infrastructure bank, where money would theoretically be divvied out in a methodical manner, as opposed to the earmark/pork-heavy process that characterizes many federally funded projects. Mr. McCain is more silent on the issue, at least on his Web site, but last year's Minneapolis bridge collapse--which has become a national symbol for crumbling infrastructure--is sure to be an issue when the Republican National Convention begins across the river in St. Paul. Read “Governor Names 2 to State’s Troubled Economic Development Agency” In the New York Times by Jeremy W. Peters. Read “Acela Trains May Expand to Meet Demand” in the Boston Globe. Photo via flickr from Snowdog.